At St Michael's Parish, in conjunction with the Schools, we are involved in a partnership with the Columban Priests and the Sisters of Our Ladys working in Manila, Philippines. The partnership has a two-fold purpose. Firstly, an opportunity of mutual enrichment and friendship between members of the St Michael's Parish and communities in the Philippines. The other purpose is to raise funds to support the Kuya Centre (a home for street boys), a micro-credit scheme which provides Filipino families with an effective way of moving out of poverty by providing loans to establish small businesses, as well as the Malate Parish social outreach to the poor. The funds are raised through a variety of functions. For more information about the Philippines Partnership contact the parish office on 5278 1343. An important objective of the St Michael's Parish is to be involved with the wider community, especially in addressing some of the concerns of our day. One of the ways we are doing this is by involvement in the Relay for Life. This community event is under the auspices of the Cancer Council of Victoria, with the purpose of the community coming together to celebrate cancer survivors, remember loved ones lost to cancer and to raise funds to find cures for cancer. At St Michael's our Relay for Life team is known as "Fr Mick's Mates" because Fr Mick, a much loved and well respected Assistant Priest, was a survivor of cancer. For just over 10 years, our team have held a number of fund raising events and friend raising events under the banner of Relay for Life, such as sausage sizzles, Melbourne Cup luncheons, bay cruises, etc. 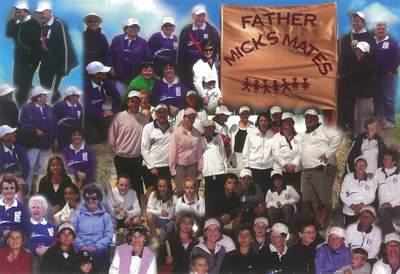 Since the inception of the team in 2007, Fr Mick's Mates received an award for Best Fundraiser in Geelong six times. For further details about Relay For Life visit www.relayforlife.org.au. The good and practical work of St Vincent de Paul is best captured in their Mission and Vision Statements. The Society is a lay Catholic organisation that aspires to live the gospel message and serving Christ in the marginalised with love, respect, justice, hope and joy, and working to shape a more just and compassionate society. Members of the Society seek to achieve their mission of service by sharing themselves, who they are and what they have, with those in need on person-to-person basis. Guided by its Catholic beliefs and ethos, it works with the marginalised in development, by respecting their dignity, sharing hope and empowering them to decide their own life destiny. Young Vinnies share the same vision and mission as the Senior Conferences, with the difference being that they are composed of youth and young adults ranging from 17-35 years of age. Activities include Kids Day Out, home visitation, soup van, social networking and companionship to the poor. Women’s Group first Monday of the month at the Community Centre at 7.30p.m. At St Michael's Parish catering after funerals is available at the Holy SPirit Chuch under the auspices of the Catholic Women's League. If you wish to use their services they will be organised by your Funeral Director. Christ is the focal point in our support to the Bereaved. The members of the Bereavement Visiting Group will endeavour to reach out to fellow parishioners who have experienced a loss through death, providing a link to our Parish Communities and resources necessary for the rebuilding pf personal and spiritual life. showing a caring presence and offering spiritual comfort. introducing (if necessary) the bereaved to other groups.